Q All the leaders have pledged to abolish the executive presidency since 1994. The JVP has taken an initiative to abolish it this time. What are your views? It is a popular political topic and slogan. There is no constructive benefit for the country from it, though. This is, in fact, a rotten political topic. Under the pretext of abolishing the executive presidential system, the country is now driven down the path of separatism. May be, the JVP is unaware of its repercussions. It is obvious from the court ruling on the 19th Amendment that it is not easy to abolish the system merely with parliamentary approval. I listened to JVP MP Vijitha Herath saying that the President would be elected by the MPs instead of the people, at a public vote, in terms of the new provision. It will amount to an infringement of the universal franchise of people. The people’s franchise is proposed to be entrusted with Parliament in this manner. We noticed how the MPs voted for certain legislations and motions despite harms that entailed for the country. They never looked at those matters from the people’s point of view. They were merely induced by cash offerings, probably in terms of US dollars, and others perks such as luxury vehicles. Nevertheless, people’s minds are pure in this instance. Though politicians get carried away by inducements, people act with mental purity. In case the power of electing the President is vested with Parliament, the MPs will get their bargaining power increased for inducements. As the Prime Minister survived the no faith motion, the President will also get elected in the same fashion of offering cash inducements to the MPs. The parties representing the minority communities will flex their muscles increasingly, creating an anarchical situation in the country further. So, we stress that the abolition of executive presidency should not be taken up, even for discussion. In the enactment of the 19th Amendment to the Constitution, many clauses were incorporated during the committee stage of the debate. Parliamentary power was usurped in a fraudulent way to enact what they wanted in the recent past. Q What are the instances you can cite to support your argument? I can cite the manner in which they enacted the Office of Missing Persons Act, the Act on the enforced disappearances. They were withheld for months and months. Finally, they were enacted. When the country’s attention was directed towards the violent incidents in Kandy, the government, with the participation of only 53 MPs in Parliament, enacted the bill on the enforced disappearances. Maybe, the violent incidents have been well-orchestrated for this purpose. The credibility of Parliament has suffered as a result. Then President the late J.R. Jayewardene introduced provincial governors as a result. A Governor is a nominee by the President. 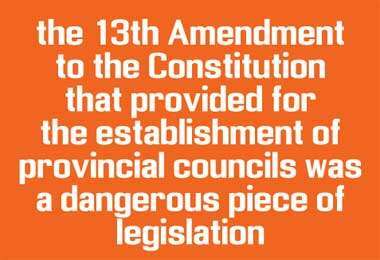 Any statute passed by a provincial council can be turned down by the Governor concerned. This power will be taken away in the case of executive presidency being abolished. If there is a clause included in the new amendment that the Governor should be appointed with the concurrence of the Chief Minister, that is it. In such an eventuality, a governor loyal to the Chief Minister but inimical to the country, can be appointed. Then, the country will become a Federal state virtually. We have the concurrent list in the current Constitution envisaging the powers vested both with the centre and the provincial councils. In case this list is abolished, the power will be clearly demarcated between the centre and the provincial councils. 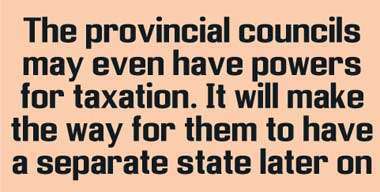 The provincial councils may even have powers for taxation. It will make the way for them to have a separate state later on. Only the Security Council should decide on the land use when it comes to national security. Today, we see the President and the Prime Minister deciding on lands and distributing them among Tamil people. There is nothing wrong with Tamil people being given back their lands. In the construction of highways and expressways, the Sinhala people compromised with their lands, making way for such development projects. As for national security, people should be ready to make compromises on their lands. People can be given alternative lands, instead. 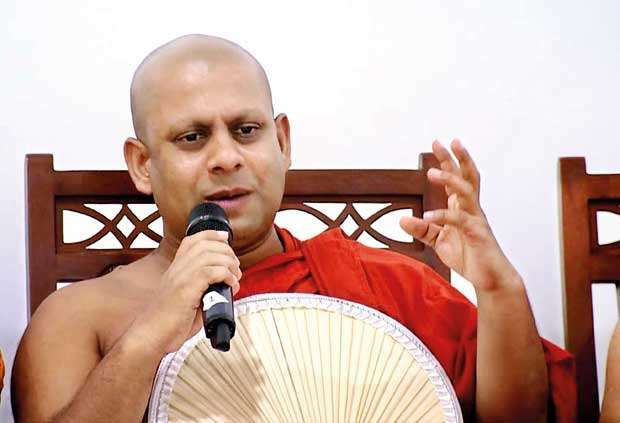 "I listened to JVP MP Vijitha Herath saying that the President would be elected by the MPs instead of the people, at a public vote, in terms of the new provision. It will amount to an infringement of the universal franchise of people"
Q How do you talk with certainty when even the final draft of the amendment is not ready yet? There is a demand for the change of the character of the constitution from ‘unitary’ to ‘united’ country. We are aware of the Singapore resolution adopted by the parties clamouring for constitutional changes here. This is a part of this Singapore resolution being adopted here, now. The JVP says the 20th Amendment, if incorporated, will apply only to future Presidents but not to President Maithripala Sirisena. President Sirisena is not the protector of this country. Also, the incoming President will not be someone inimical to the country. The President is appointed by the votes from people throughout the country. But, someone elected by the votes of people from one particular district is chosen as the Prime Minister. The President is someone who polls more than 51% or more votes from people in the entire country. That is the difference between the two. The people’s sovereign right has to be protected. The Prime Minister does not account for the country today. The President is also the same. Whenever a serious issue is raised in Parliament, the Prime Minister mockingly laughs at it and dodges the problem. The entire country has become a mockery as a result. The President should be held answerable to the whole country. Today, the President has submitted himself to the Prime Minister. Today, two key officials assigned to the President’s Office have been arrested. It is not something that happened by chance. It is a well-orchestrated plan. Otherwise, action should have been taken to arrest those responsible for the Central Bank bond frauds. The government remained silent till the biggest fraudster of the bond scam fled the country. The presidential post lost its shine today. There is a perception now built that anybody can become a President. If there was any measure of dignity left, that was also taken away when his Chief-of-Staff was arrested by bribery sleuths. In some countries, people do not care for their Presidents. These countries have fallen into anarchical situation. The same is happening here now. No President ever compromised the dignity of his post. Now, the current President has compromised the dignity of his profession. By arresting the Chief-of-Staff, there is a message sent to the world that the key officials of the President who vowed to root out corruption, are also indulgent in frauds. "In case the power of electing the President is vested with Parliament, the MPs will get their bargaining power increased for inducements. As the Prime Minister survived the no faith motion, the President will also get elected in the same fashion of offering cash inducements to the MPs"
Q The present President keeps contacts with you. Have you discussed this matter with him personally? I normally discuss the matters relevant to the country with him. I asked him not to alienate the national assets of the country. When the government tried to lease out the Hambantota Port to a Chinese company, I asked the President not to allow that to happen. Then, he asked how the government could settle the debt burden. It is not a question to be directed at us. He, as the President, should have an action plan for it. We discussed about the war heroes. Today, our intelligence chief is incarcerated. 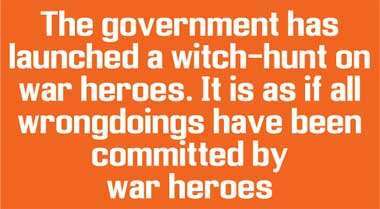 The government has launched a witch-hunt on war heroes. It is as if all wrongdoings have been committed by war heroes. No one from the LTTE has been arrested. Politicians are involved in so many frauds. But, none of them are arrested. The government is doing all these things to please the pro-LTTE Tamil Diaspora. "If anybody tries to abolish the executive presidency to make Mr. Mahinda Rajapaksa the executive Prime Minister, we do not agree. Mr. Rajapaksa is not an immortal. Who is there to look after this country after him?" Q There is a perception that some are opposed to the abolition of the executive presidency because they plan for making Gotabhaya Rajapaksa the next President. What is your view? We are opposed to the abolition of executive presidency because it is needed to protect the country. Otherwise, it is not because we wanted to make someone the President. There is no heir to the executive presidency. Nobody thought Mr. Sirisena would become the President. Actually, consequent to Mr. Sirisena’s presidency, a lot of unworthy people also harbour presidential ambitions today. The executive presidency is part and parcel of the current Constitution. The country cannot be governed without the executive presidency. Now the government has breathed life into the tiger by enacting the 13th Amendment. Yet, the tiger is caged. In fact, the tiger is caged to the post called executive presidency. If you abolish the executive presidency, the live tiger is untethered. It will run amok and cause havoc. The tiger is the allegory for separatism here. In the run-up to the presidential election in 2015, there were those who vowed that they would be in the forefront to protect the country in the event of any attempt to divide the country. They are not to be seen even today. They talked about a new country within 100 days. Today, we have a police that charge at women in temples with wooden poles. This is in stark contrast to what they promised to people ahead of the presidential elections. I respect Mr. Mahinda Rajapaksa the most, not because of anything but because of the fact that he resurrected the country from terrorism. If anybody tries to abolish the executive presidency to make Mr. Mahinda Rajapaksa the executive Prime Minister, we do not agree. Mr. Rajapaksa is not an immortal. Who is there to look after this country after him? "Today, we see the President and the Prime Minister deciding on lands and distributing them among Tamil people. There is nothing wrong with Tamil people being given back their lands. In the construction of highways and expressways, the Sinhala people compromised with their lands, making way for such development projects"
Q You keep contact with the joint opposition. That is also divided on the abolition of executive presidency. How do you see it? Already, India’s RAW is in operation, cultivating both sides. They are asking the Joint Opposition to be neutral. They are asking the other side to implement the promises made to people in this regard. If Prime Minister Ranil Wickremesinghe is assigned the task of abolishing the executive presidency, there will be a major public uproar. Therefore, they are using a cat’s paw for it. That is, JVP Anura Kumara Dissanayake and others in the party. The JVP is a set of soul-less creatures in the political sense. They also face bribery charges by Minister Wijeyadasa Rajapakshe. They have politically drifted towards the right of centre from left of centre. Anura Kumara Dissanayake is virtually the spokesman for UNP’s Sirikotha. The rev. prof. has a short memory. Did we have a President before 1978?